Jesus Montero is still just 26 years old, and he’s having a pretty decent season at the plate. He’s batting over .300, and he has his OBP close to .350 and his slugging percentage close to .450. All things considered, that’s not a bad campaign. But for the fact that Montero has spent the summer in Triple-A, and he’s split his time between first base and DH. He’s mostly been the DH. It’s hard to believe now that Montero spent three consecutive years within the Baseball America prospect top-10. Though the pop remains in his bat, there’s pretty much nothing else to speak of, and Montero has stood as a cautionary tale to those who’ve been high on Gary Sanchez. Not only did they rise through the same system — Montero and Sanchez have had similar roles and similar strengths, with similar criticisms and similar questions. They even made similar first impressions. At least for the time being, Montero is there to keep Sanchez fans grounded. Yet Gary Sanchez is no Jesus Montero. I get that the parallels are many. But the profiles are dramatically different. Sanchez is looking like he can hit. Even more importantly, Sanchez is looking like he can catch. So Sanchez can maim a baseball. This isn’t necessarily new information, but now he’s started to do it in the majors. If I had to offer some criticisms, I’d say first that Sanchez hasn’t generated a lot of consistent loft. His flatter swing plane could cause him to fall short of his power ceiling. Montero has also struggled with that issue, not that it’s permanent, and also not that it’s terrible. Teams and hitters are happy with line drives. Good contact is good contact. Sanchez, I’m sure, is going to run into some adjustment problems, unless he discovers right field. The way he shifts his momentum forward causes him to commit pretty early, and that can have an effect on his discipline. Sanchez probably won’t walk a ton, at least for a while. He’ll have some ugly strikeouts and rolled-over grounders. Peak Sanchez should look more polished, and that’ll take some progression. The current swing has vulnerabilities. But of course there are vulnerabilities — Sanchez is a 23-year-old rookie catcher. You wouldn’t expect that he’d have everything figured out. He’s probably still playing on adrenaline, and at the end of the day, this is a powerful hitter with roughly average bat-to-ball skills. There’s a lot about Sanchez’s offensive game to like, whether he ends up someone with a wRC+ of 100 or 125. The key for Sanchez is that his own bar is lower, and it’s lower because he’s an actual backstop. This is the huge, huge difference between him and Montero. As a catcher, Montero was faking it. Sanchez is the real deal. And while he can get handcuffed, he still keeps himself fairly steady, and this can improve with better familiarity with the pitching staff. Not shown: Sanchez has also thrown out Mike Trout, even though the throw itself bounced. You don’t want a throw to bounce, but the pitcher was kind of in the way, and it says something that Trout was out anyhow. Sanchez throws well, and — just as importantly — he’s quick to his feet. In baseball parlance, there’s nothing wrong with his pop time. Jesus Montero caught 13 runners out of 94. I understand why Montero’s name comes up. I even understand that Sanchez might end up a Montero sort of hitter. It’s not impossible. The approaches are similar. Montero was never short on power. Yet Sanchez ought to be better than that, because Sanchez has demonstrated he’s a harder worker. And in large part because of that effort, Sanchez has turned himself into a legitimate defensive catcher. That’s something Montero could never do, and as a big-league career goes, that’s a total game-changer. When you can’t catch, you have to hit. When you can catch, offense is a luxury. Sanchez catches. For now, Sanchez also hits. 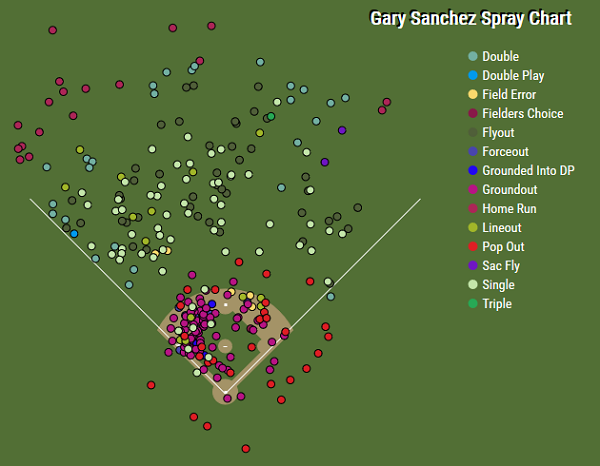 Slumps will come, and we’ll see how they’re conquered, but Gary Sanchez is very much on his own track, and it promises to lead to a striking destination. We hoped you liked reading Gary Sanchez Is No Jesus Montero by Jeff Sullivan! Gary Sanchez just homered while I was reading this article.